As we've seen in past columns (and we'll revisit in future columns to come), Toy Biz had some great action figure lines based on the classic Marvel Comics Super Heroes. With an entire universe to choose from, there was seemingly no end to the number of characters to get the plastic treatment and join action figure fans' collections. In 2005, Toy Biz introduced a new line of action figure in the 4" scale...Super Hero Showdown! This line was designed for a dual audience...action figure collectors and gamers. There were some cool collector cards and tiles utilizing existing artwork of the characters in battle sequences, but the gaming aspect never really caught on with fans. These figures were also exclusive to Toys "R" Us stores, and the line was broken into two segments: Starter Sets of 2 figures and 2 waves of Booster Packs. This wasn't exactly a huge hit with fans, because we had grown accustomed to the 7" Marvel Legends line for and while this scale was very popular with a certain galaxy far, far away...it wasn't immediately obvious that these would become popular. In 2006, Toy Biz pulled out all the stops with this line ...as they did with pretty much every other line they made that year, because this would be the final year they would be creating Marvel Comics figures. So, rather than compete with themselves, the name changed to "Marvel Legends Showdown" and they added another pair of Starter Sets, 2 more waves of Booster Packs, and the addition of a new wave of Rider Packs. There were no dedicated chase figures this time out, because nearly every figure in 2006 included a variant..sometimes a simple deco change, other times a brand new head sculpt was added. You can see all of the figures below, in the brand-spanking-new interactive menu page I just created! 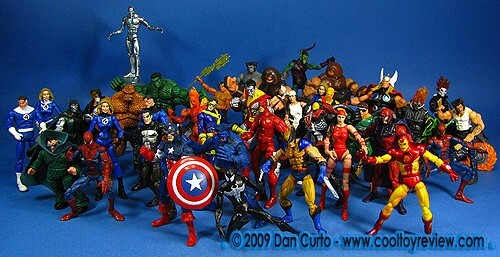 For a longtime Marvel Comics fan like me, this was a great line of toys. Sadly, Super Hero Showdown was doomed from the start. The first year had a lot of competition, not only from Toy Biz's very popular Marvel Legends lineup, but also the Star Wars: Episode III - Revenge of the Sith series which dominated the toy aisles that year. As I mentioned above, most fans didn't really know what to make of this series...is it a game? is it an action figure line? The next year was even worse. Toy Biz changed the name of the line to "Marvel Legends Showdown" (a move that was done with other toys as well, regardless of the scale, to establish the brand), and it was no longer exclusive to Toys "R" Us stores. You'd think that a wider release would be a good thing, but it wasn't. The exact same figures from 2005 were simply rebranded and released again under the new name...but fans who wanted them had already picked them up the previous year. So we waited patiently for the new figures to come out, because they were sweet! However, the glut of these repackaged waves killed the line too soon, as stores had a mountain of the first wave, and no room for additional product. While the Starter Sets & Rider Packs were fairly easy to come by, wave 3 (and most particularly wave 4) was very hard to track down. Some creative hunting was needed to complete this series, including involving members of my local collecting group, who hit every store in the area. They was a very limited release at KB Toy Stores, Big Lots, Dollar Stores, Marshalls (even an outdoor store? ), but most of the chase & variant figures were only acquired through eBay or other trades over the years. There was another very big problem with the "Showdown" line. While the sculpting was top-rate, and many of the figures were beautifully designed, they have a very annoying habit of falling down...and falling apart. The joints holding the limbs together didn't quite fit, and legs and arms fell off, the torsos on several figures don't stay together very well, and the weight of some of the larger characters caused them to lose their balance and topple over, creating the dreaded 'domino effect' in my displays. For kids (even a big kid like me), this just isn't fun. Who wants a toy line where they fall apart the moment you touch them? Don't get me wrong...I like the figures in this line, but I can't imagine kids would be pleased to get broken toys upon opening them up. Now, each figure included a base and support rod system to hold them in their multiple poses (which was an element in the game, actually...what kind of cool poses can you create?) and these figures are loaded with points of articulation...which brings up an interesting question: is there such a thing as TOO MUCH articulation? In the case of the Marvel Showdown line, the answer is most definitely "yes". Still, being a longtime die-hard Marvel Comics fanboy, I couldn't rest until I had completed this line, and as you can see in my new interactive menu page, I have finally done so.